In 1870, five years after Abraham Lincoln was assassinated and eighteen years after the first claim was staked in what is now known as St. Ansgar, a small group of European emigrants, seeking religious freedom and prosperity, arrived in Iowa by way of Wisconsin. Their Lutheran heritage continues with many namesakes in today's congregation. Those in that early group included: Fred Hartwig, Henry Kuehl, Carl Mueller, August Nienow, George Rosel, Leonard Rosel, Carl L. Tessman, and Christian Zerck. The families were ministered to by Lutheran traveling ministers, the Rev. Theodore Mertens and the Rev. F. Doescher, who preached in private homes and later in the old stone schoolhouse of St. Ansgar. With the help of the Rev. Doescher, a Divine call was sent to and accepted by the Rev. Edward Wiegner, a German emigrant and Concordia Seminary graduate. The congregation organized in August of 1874. Three years later, twelve more families joined the early congregation: Frank Buty, the Ebbighausen family, Carl Groth, Friedrich Kruger, Herman Hartwig, Henry Hoppe, Christian C. Moeller, John Moeller, August Mueller, Carl Neinow, Edward Ruechel, and Herman Treichel. 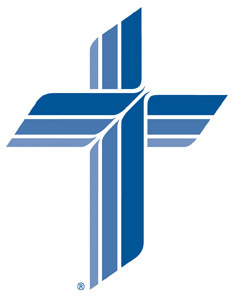 In 1879 the congregation united with The German Evangelical Lutheran Synod of Missouri, Ohio, and Other States. 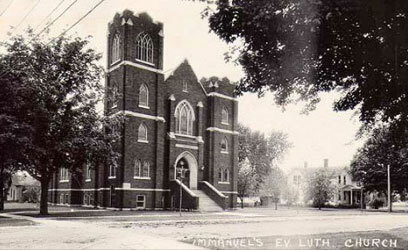 Immanuel Evangelical Lutheran Church incorporated March of the following year. German was the official language used in both the church and its parochial school. After 1890, English was introduced into the school. A transition from all German services to English came gradually. By 1934, English services were conducted every Sunday and German services every second Sunday until 1946 when there were four German communion services a year. This, too, was phased out in time. In 1924 Calvin Coolidge was president, World War I was six years past, and the congregation of Immanuel was erecting a larger building, complete with pipe organ, church bell, and stained glass windows. The new building at 312 West Fifth Street was modeled after a Lutheran church in Mankato, Minnesota. This new building replaced Immanuel's second church building that was an unused Baptist church, built in 1878. Before the Baptist building, the congregation met in a building at 204 South George Street. The first floor provided room for a parochial school and church services while the second floor served as the parsonage. Early services, before the congregation owned a building, were held in private homes and in St. Ansgar's stone school. In 1874, within a few months of assuming his duties as pastor, the Rev. Wiegner organized a Christian Day School for the children of Immanuel's congregation. He though parochial school for five days of the week, instructing them not only in religion, but also in traditional school subjects. Before a school building was erected, the classes (and Sunday services) were held on the first floor of the Wiegner's home. Ten years after the Christian Day School was established a school building was erected on the site of the present parsonage. Sold 40 years later, the parochial school building became a grocery store in the east part of town. The Christian Day School closed in 1906 when the additional expense of hiring a teacher was declined b the congregation. 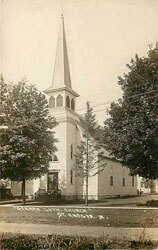 Immanuel's Sunday School was established in 1921 after discontinuing the Christenlehre (children's recitation), conducted during regular Sunday morning worship, and during the transition from German to English services. In 1971, after years of Sunday School classes in the church basement, a new 14-room education center was added to Immanuel's church building. Today Vacation Bible School, confirmation classes, adult Bible studies, and Sunday School are all part of Immanuel's Christian education. The Gathering Space addition was added in 2010. God has been with us. He is with us. He shall be with us. Now, we look forward with the confidence of God's blessings and eternal presence. To Him be all glory forever and always.